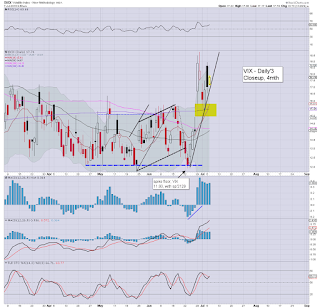 Whilst equities put in a new cycle low of sp'2044, the VIX put in a marginally lower high of 19.20. 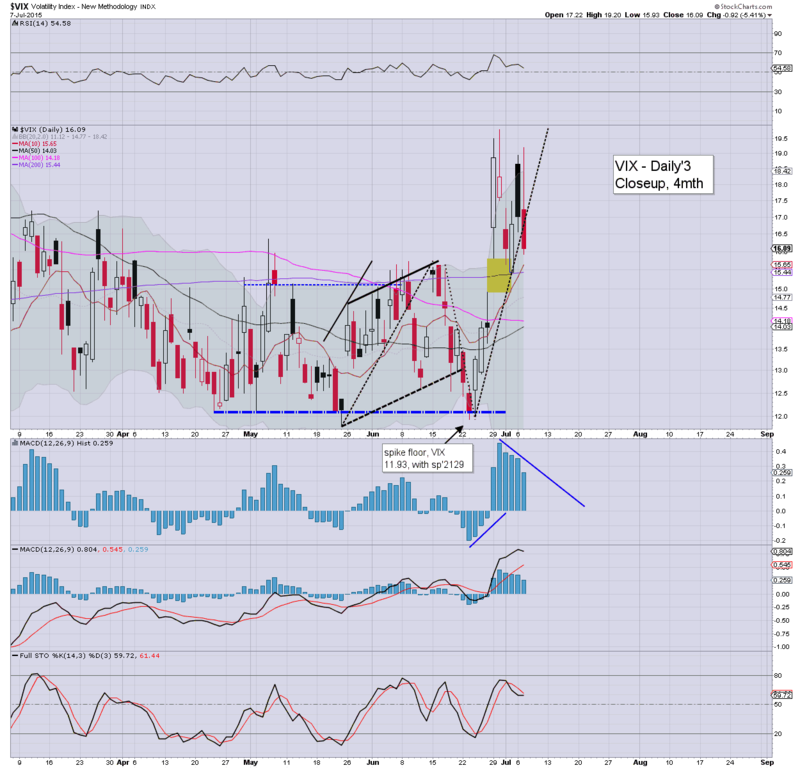 With equities rallying into the close, the VIX turned negative, settling -5.4% @ 16.09. Near term outlook offers a little equity chop... but with broad upside into August. Suffice to say.. we very likely have a key VIX cycle high of 19.80 (June 30th'). There have been a fair few instances over the last few years where the VIX will put in a marginally lower high... whilst equities put in a marginally lower low.. to complete a multi-week down cycle. That seems to be the case today. There will of course be further sporadic Greek news headlines in the days ahead, but from a pure chart perspective... we have a VIX top... and an equity floor. 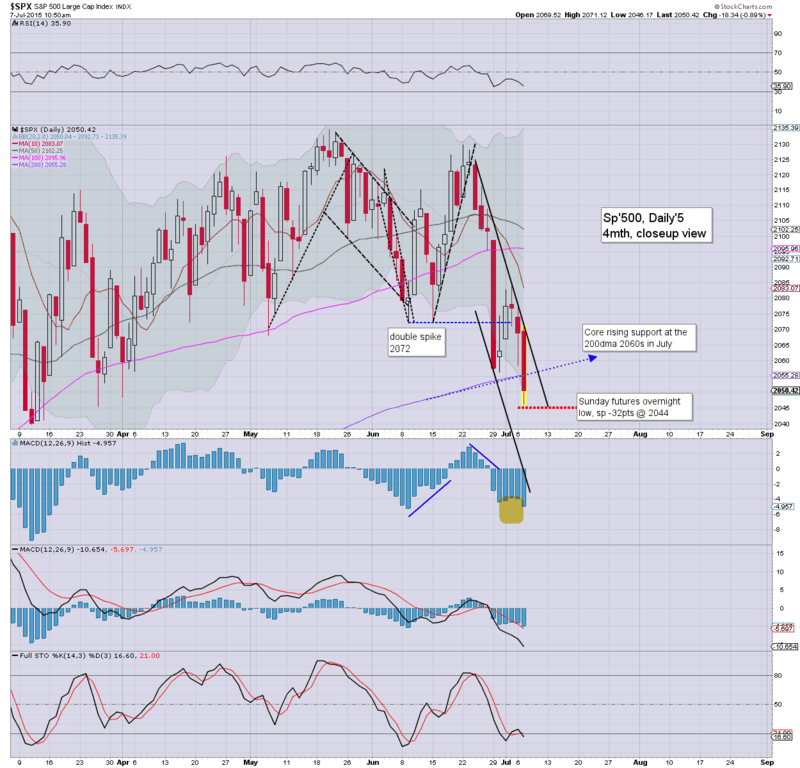 Well, today was a pretty dynamic day, opening with minor gains, a significant reversal, with a morning low of sp'2044. The afternoon price action was a rather severe short-stop cascade swinging from 2062 to 2081 in just 40mins. All things considered, we very likely have a key multi-week floor of 2044.. and now look set to push back into the 2100s. Whether we make new historic highs into early August.. difficult to say. 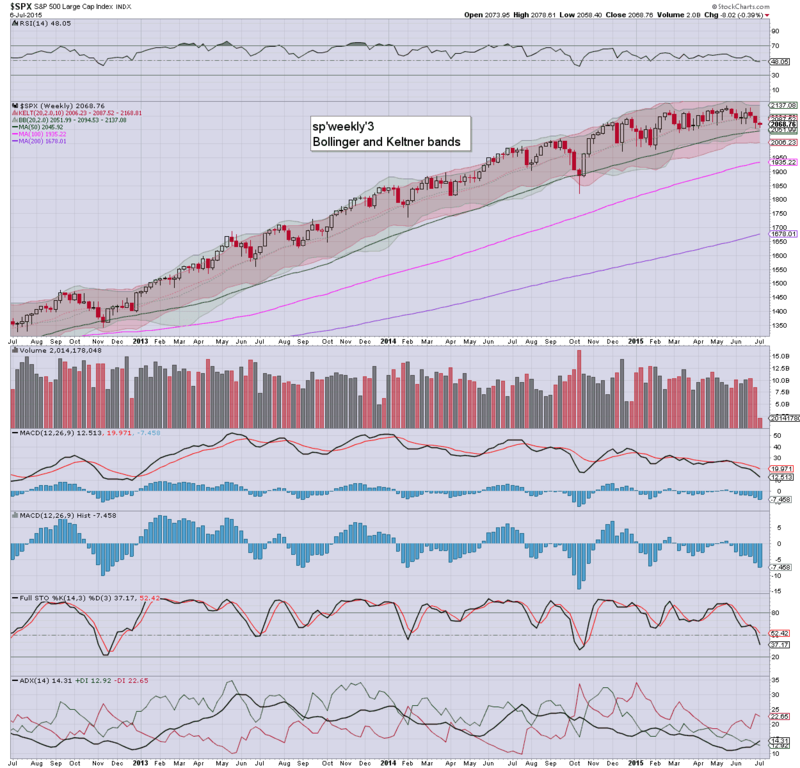 What I do say with confidence is that the market looks set for some 'problems' in Sept/Oct. *I remain seeking to go long INTC... will assess tomorrow morning.. around 11am. Well... the morning low of sp'2044 is increasingly looking pretty clear... as also reflected in the VIX. No doubt there will be more sporadic Greek headlines across this week.. and indeed the months to come, but.. for now.... the market looks floored. 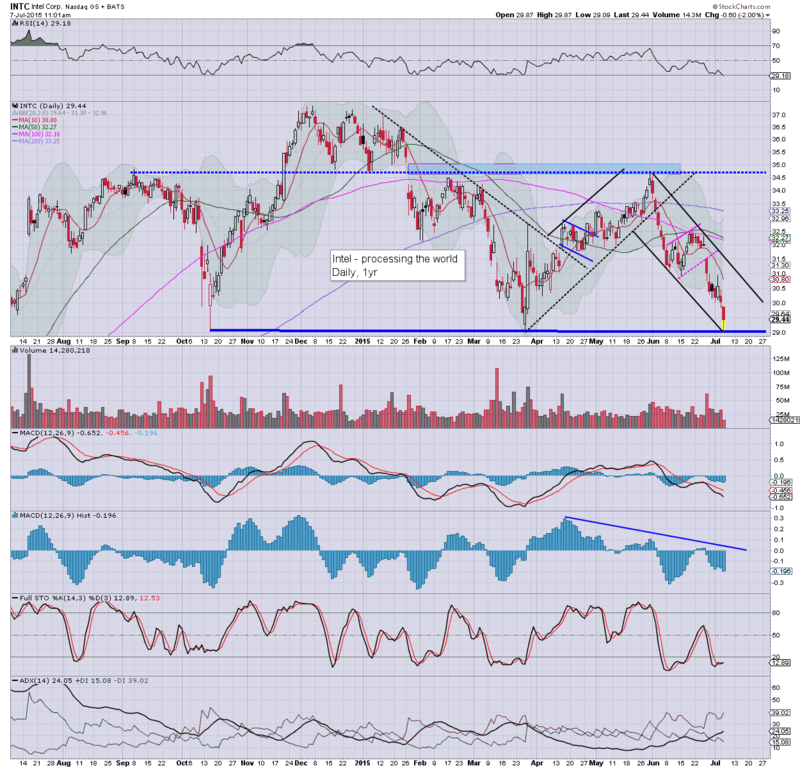 *there remains threat of weakness early tomorrow.... and I will look to pick up INTC-long... if it opens higher... I simply won't chase it. 3.16pm... a little weak chop... but regardless of the exact close... a day for BOTH the bears.. and bulls. No one can complain today... bears got plenty of opportunity to exit this morning... and bulls had time to go long from a much better level. Yours truly will re-assess tomorrow morning at 11am... seeking an INTC-long... but clearly, anything <$29.50 looks unlikely. 3.32pm.. sp +13pts @ 2082.... 38pt swing.. biggest of the year. 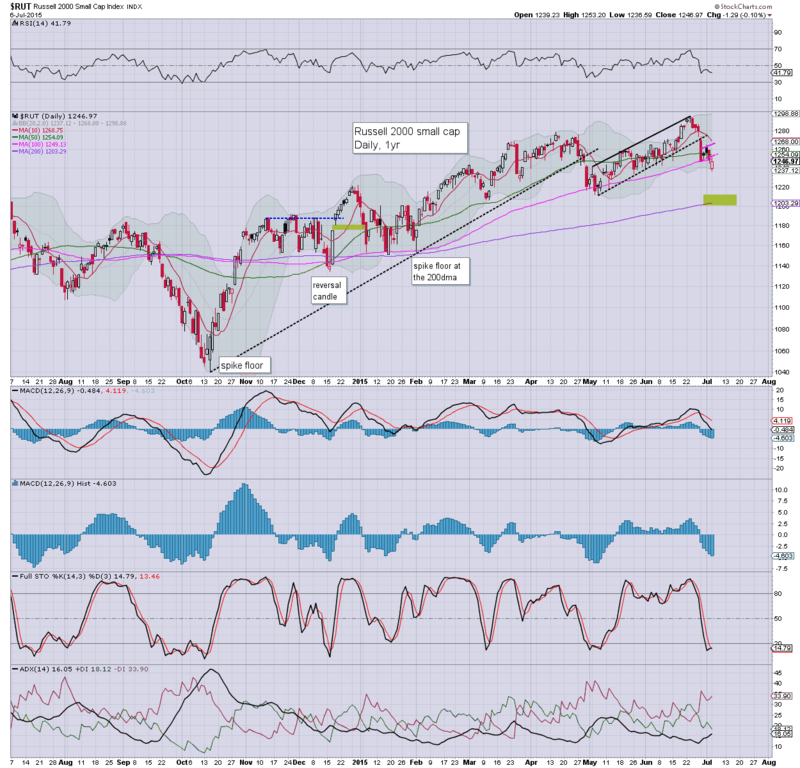 US equity indexes have managed to claw their way to break even, with the sp'500 u/c @ 2068. A moderate wave lower.. probably into early Wednesday looks viable... but this morning's low of 2044 looks set to hold into August. Metals remain weak, Gold -$14, with Oil -1.9%. Well.. its the 2pm hour.. we've seen a rather natural bounce from late morning.. now its a case of whether the bull maniacs can hold the earlier low of sp'2044.... into the close.. and more importantly... across tomorrow morning. If so.. then its broad upside into early August... which will make for a rather interesting cycle setup for Sept/early October. ... I'm seeking a moderate wave lower to the $29.30/20s.... if not by the close.. then by 11am tomorrow. Either way, I ain't interested in chasing from the $29.70s. 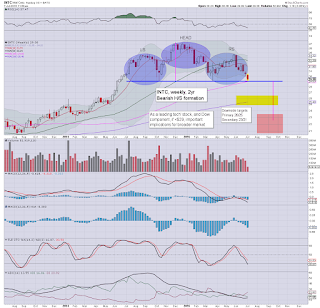 There is a very tempting upside price gap zone of $31.50/32.00, for August. 2.47pm... Hmm... a spike high... sp'2075.... and things are starting to get a little crazy. VIX -2% in the 16.60s.... more sporadic Greek news? US equities are likely in the early phase of building a floor from the morning low of sp'2044... with VIX having maxed out at 19.20. USD is holding gains of 0.8% in the DXY 97.10s. Commodities are well above the earlier lows, but still.. Gold -$12, with Oil -1.5%. Another minor wave lower looks due this afternoon, but the earlier lows should hold. notable weakness: miners, GDX -4.4%... bigger weekly/monthly cycles look dire. 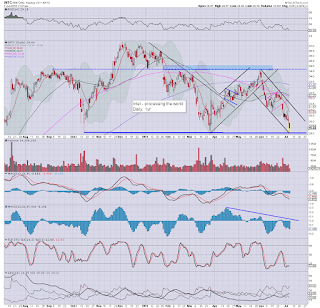 *I am seeking to pick up INTC in the low $29s... upside target would be the 32s. If it doesn't cool from current levels, I will not chase it. There is increasing probability we have a key cycle floor of sp'2044, with a divergent lower high of VIX 19.20. Despite the ongoing Greek drama, there are a number of indirect signals suggestive that the down wave from sp'2129 is complete. *I realise some of you might still be rolling their eyes at my 'indirect/proxy signal' of INTC, but it has the cleanest price structure out there. 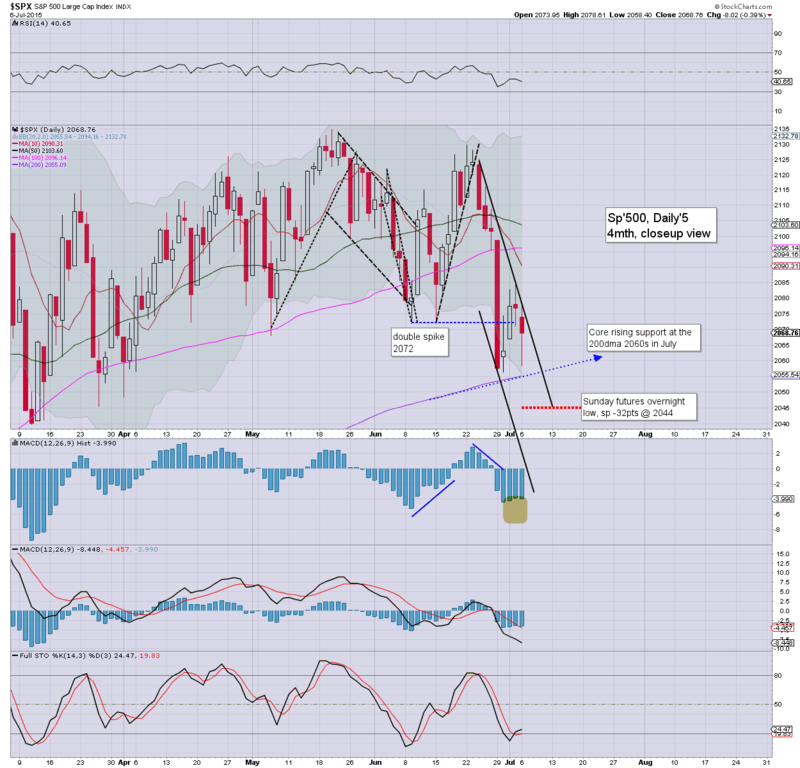 I hold to the original targets... and if correct, it would be suggestive of market upside into August.. regardless of the Greek situation. As for the broader market... a classic case of an 'overnight futures low' being tested and held in the cash market. Rest of the day could merely be chop.... should give everyone a chance to re-position. 11am update - may I quote general order 12? 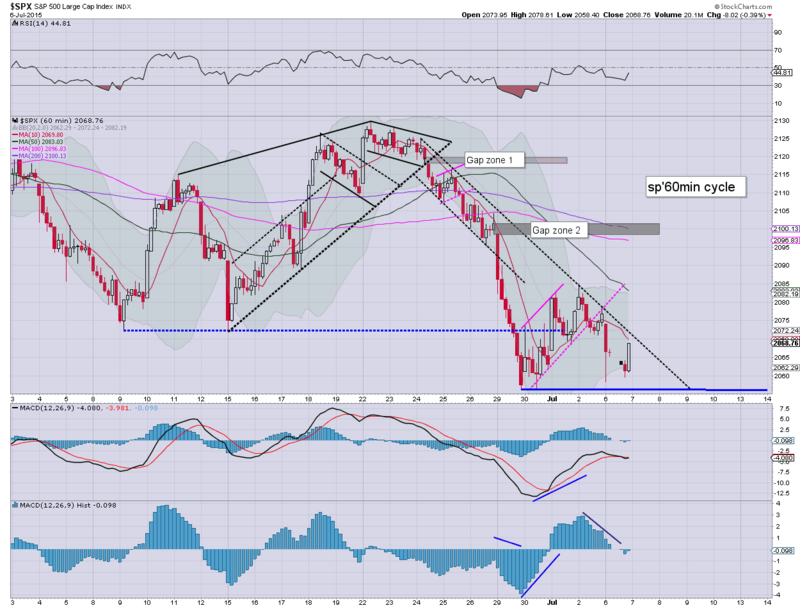 US equities have swung significantly lower, with some notable lows taken out. 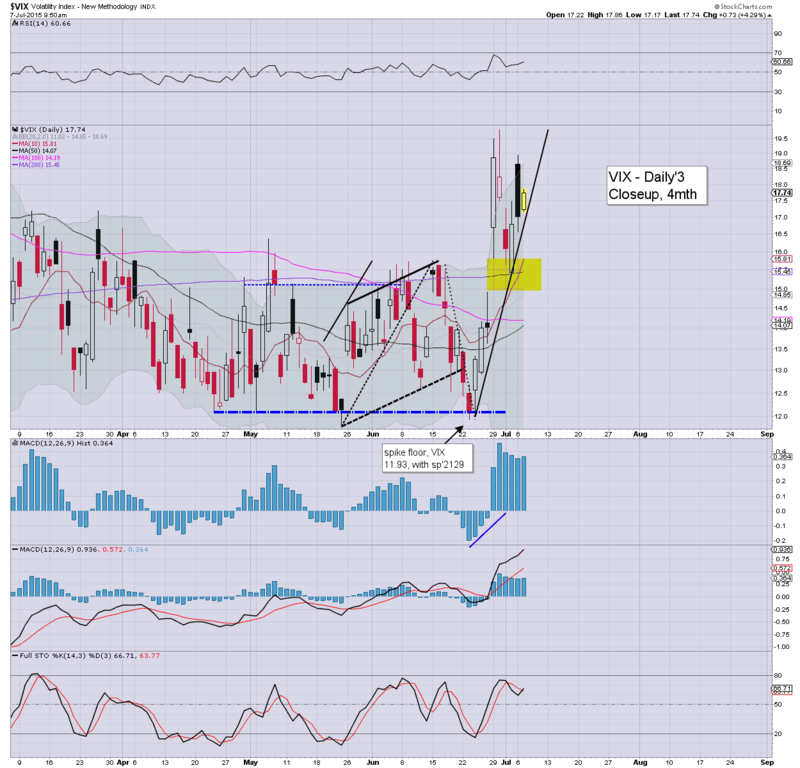 VIX is confirming the renewed market concern about the lack of a Greek resolution, +10% in the 18.80s. With the USD +0.9% in the DXY 97.10s, commodities are in destruct mode, Gold -$16, Silver -5.1%, with Oil -4.2% in the $50s. *Gold/Silver bugs should be waving the white flag... as Silver decisively breaks the Nov'2014 low... Gold... along with the related mining stocks are set to follow. So, overnight gains.. an opening reversal.. and we're in the sp'2040s. Its now the typical turn morning floor time of 11am... so.. a bounce into mid afternoon is probable. 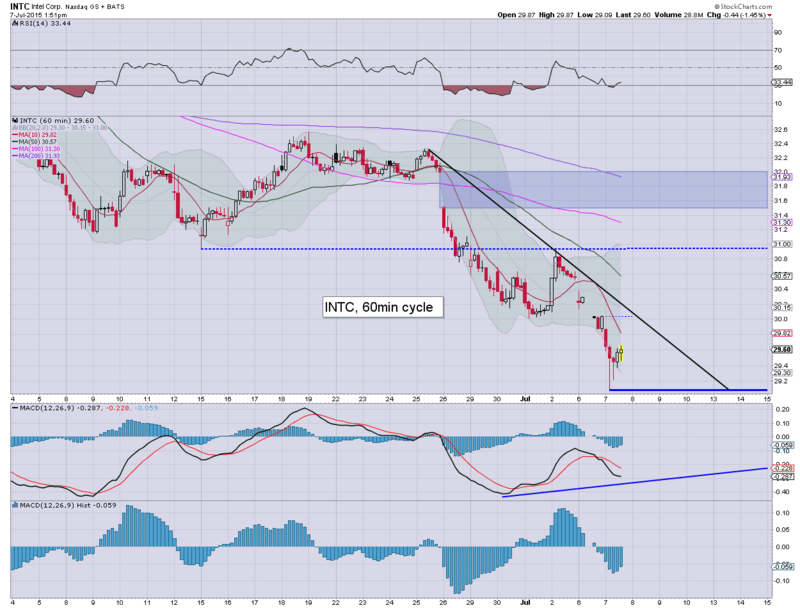 *INTC hit $29.09.. which might be a cycle floor. For now... I'm content to watch.. will consider a long position.. if the $29s continue to hold. ... the Admiral is well aware of the regulations. We are clearly in early phase of a sig' correction.. that will last into Sept/Oct. The more severe move though... not this cycle. Bears will need to be.... careful. Target effectively hit... and we're already seeing a spike floor being made. I expect 29s to hold. 11.35am... The Sunday night futures low.. now being tested,... with VIX 19s. 11.45am.. We have a double spike floor on the hourly chart.... looks like sp'2044 is the key low... with a lower VIX high of 19.20. US equities open higher... but have seen a classic opening reversal, as reflected in the VIX, +4.3% @ 17.70s. 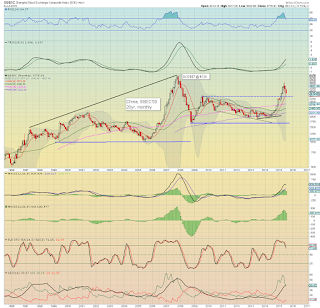 USD is building strong gains, +0.8% in the DXY 97.00s. Metals are weak, Gold -$11, whilst Oil is -2.3% in the $51s. *I am trying not to get lost in the minor noise... all those getting overly hysterical at the overnight gains.. well... what do you say now? So.. we 're a little lower, first target is the Monday low of 2058, but more importantly.. the 200dma of 2055... and then the Sunday night futures low.. around 2044. 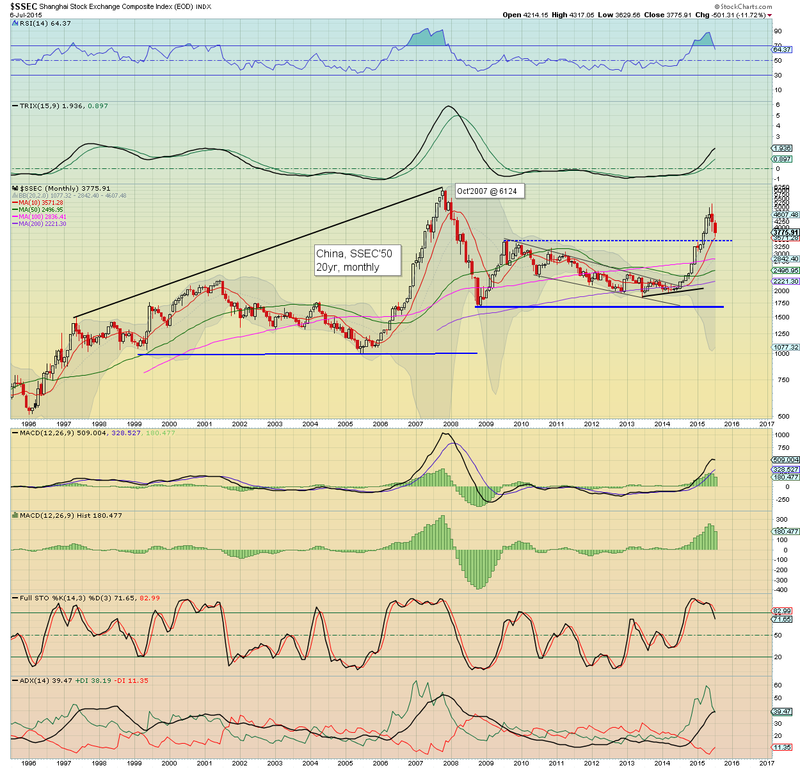 There seems little reason why we won't keep falling... as the Greek drama continues to unsettle many. 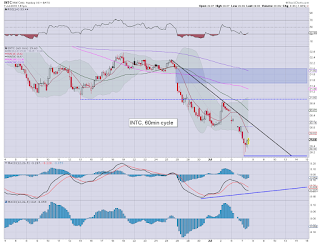 I continue to see INTC as a valid indirect signal/proxy for the broader market, -0.9% in the $29.70s. Target remains the low 29s... before a bounce into August... as the main market should similarly see. 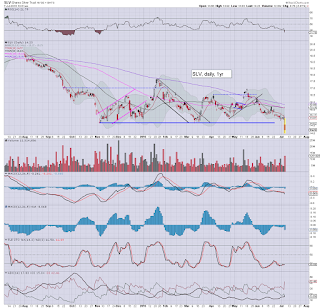 BABA -3.8%, $77s.... having lost the key $80 threshold.... no real support until the IPO price of $68. 10.08am... and there goes the Monday low..... next up... 2055. 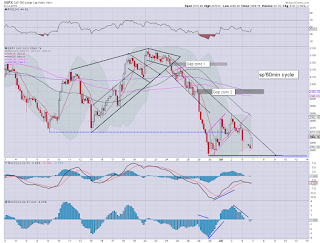 10.10am.. fractional break of the 200dma at sp'2055. 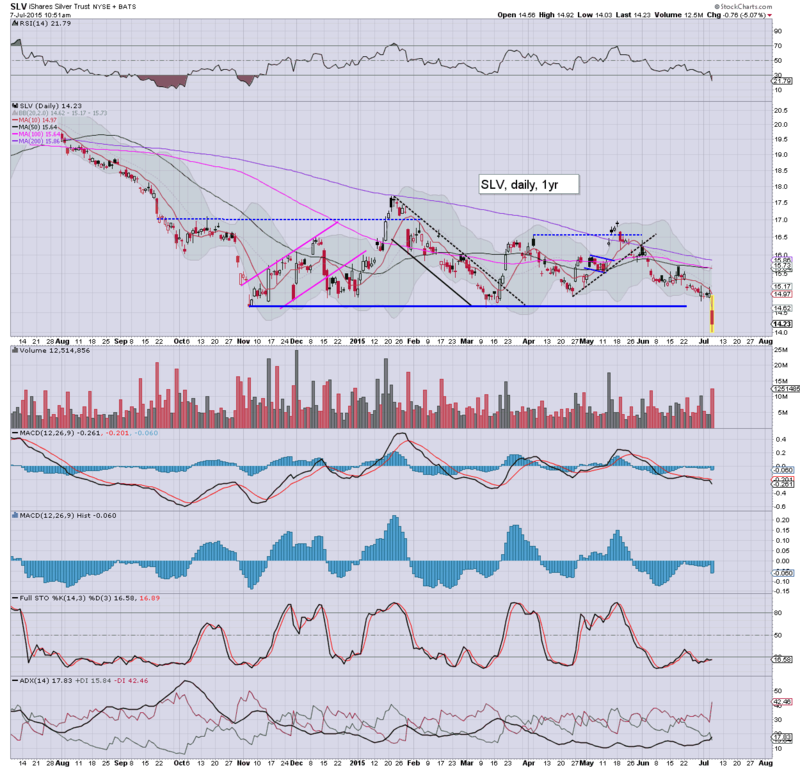 FCX -10.3%... imploding.. with Copper -4.3% @ $2.43..... support in the 2.30/20s. Gold bugs will be getting rattled now... Gold -$15.... $1155.... just $25 to go. 10.18am... next up... the Sunday night futures low of 2044. Seeking a VIX spike in the low 20s..... with INTC around $29.00..... should mark a cycle low. 10.29am.. another snap lower... sp'2053.... VIX 18.40s..... the 20s still look due... would be more suggestive of sp'2020s.. than just 2040/30s. 10.38am.. Metals destroyed.... following Oil.... Silver breaks the 2014 low.... Gold set to follow.. along with the related miners. Gold bugs... its GAME OVER. 10.42am.. INTC $29.13.... effectively at target...... market needs to level out soon.. or 29s will fail.. and then we have a major problem. Good morning. Futures are moderately higher, sp +8pts, we're set to open at 2076. USD continues to strengthen, +0.8% in the DXY 97.00s. Metals are naturally lower, Gold -$4. 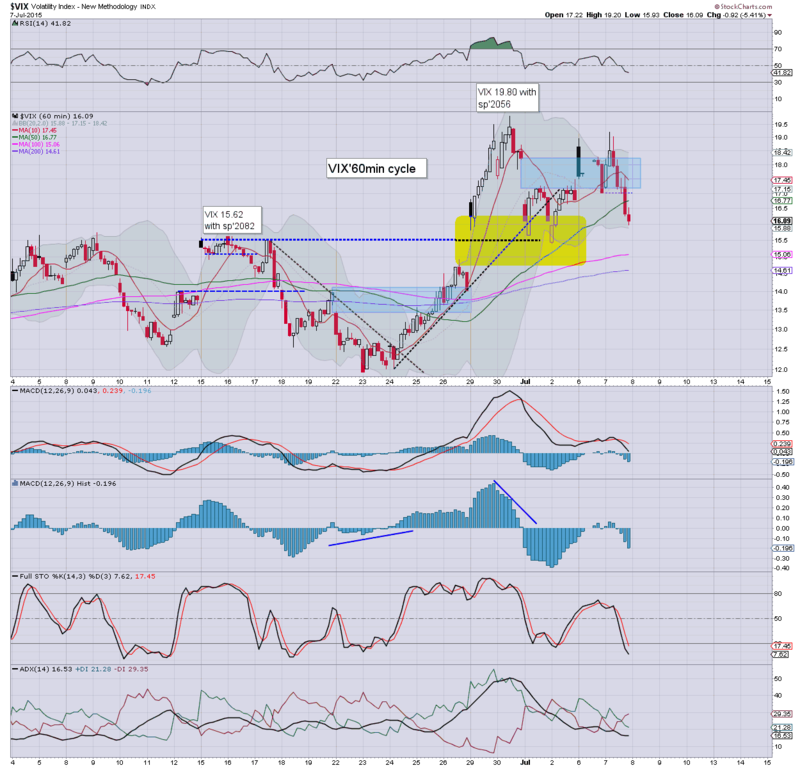 Oil remains exceptionally weak, -1.1% in the $52s. So, we're set to open back at the Friday closing level. All things considered, the market should see increasing weakness after the usual turn time of 11am. I would expect a net daily close in the 2050/40s. 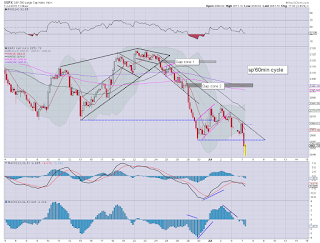 Overnight China action: a new cycle low of 3585, but settling -1.3% @ 3727. Clearly the Chinese leadership will be getting real frustrated as the selling continues. My 'crazy' target of the 3400s - that was I touting when 5K was hit... we're almost there. If 3400s fail to hold... there really isn't anything until around 2500. 8.28am.. 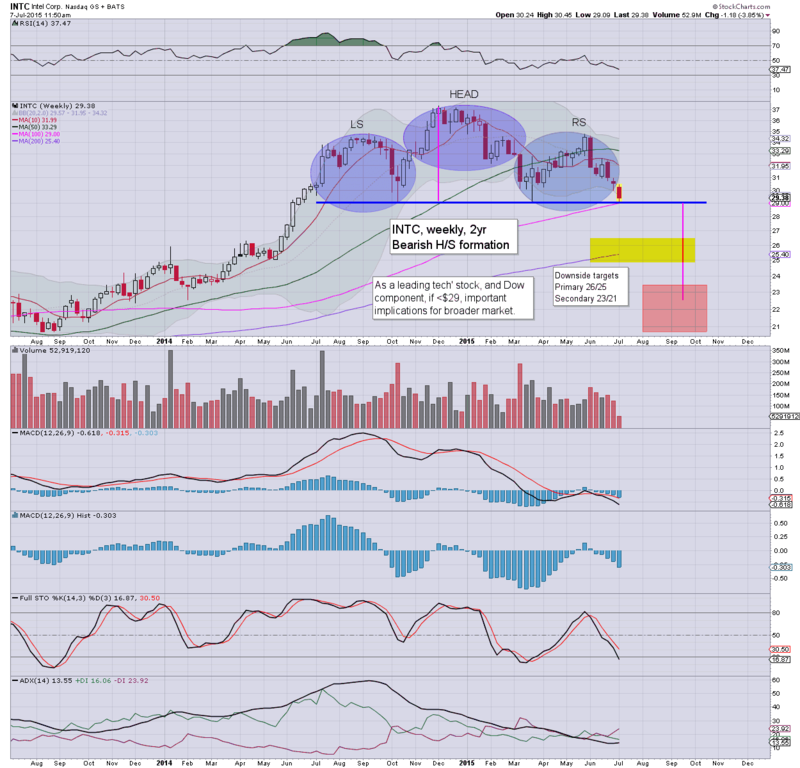 Notable weakness: semi-conductors, AMD -16%... lousy earnings.. and that is impacting INTC, -0.8% @ $29.80... on track for the low 29s... before first opportunity of a $2-3 bounce into August. 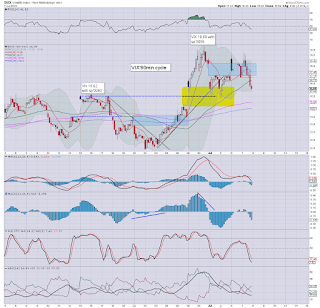 YINN (3x long China) -13% in the $32s. 9.37am.. Major fail for the bulls... opening reversal... indexes already red... VIX +3% in the 17.50s. 9.42am Train wreck open for the bulls..
notable weakness, INTC -1.5% in the $29.60s... almost there. 9.47am... sp -5pts.. 2063.... first target remains the Sunday night futures low.. equiv' to 2044. Whilst US equities closed moderately lower, the more dynamic price action remains in the Chinese market. 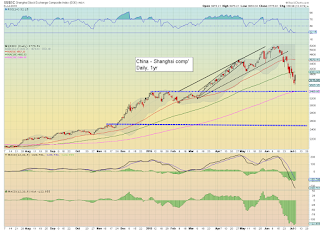 The Shanghai comp' opened higher by almost 8%, but settled +2.4% @ 3775. 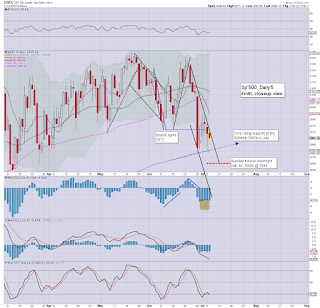 The 3500/300 zone remains a valid target in the immediate term. Suffice to say, June was a clear mid term top in the China market - following slightly earlier tops in most of the EU markets. China looks set for further downside in the immediate term.. but could floor in the 3500/300 zone.. before a bounce back to 4000/4500. There remains serious threat of sustained price action <3400 in September.. and if correct.. that would make for a 50% crash, flooring around 2500. Despite the increasingly desperate intervention of the Chinese leadership to 'inspire' higher stock prices, on any fair basis, it seems overly risky to go long China, at least until early October. Tuesday will see intl' trade and consumer credit (3pm). However, no doubt the US/world capital markets will be almost entirely focused on the continuing Greek drama.. as negotiations are set to begin between an increasingly resolute Tsipras.. and the Troika. 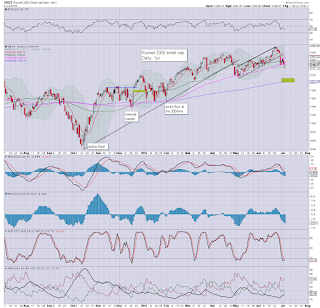 US equities closed moderately weak, sp -8pts @ 2068 (intra low 2058). The two leaders - Trans/R2K, settled lower by -0.5% and -0.1% respectively. Near term outlook is for further downside to the 2040/30s.. with VIX 20/21s. A key cycle low is due, with renewed upside into early August. 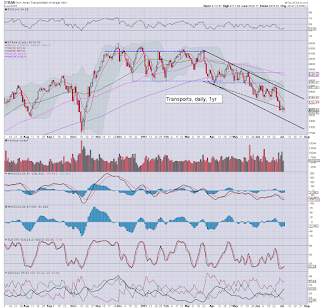 *Trans remains notably weak.... next support is the 8K psy level, with declining trend around 7900. 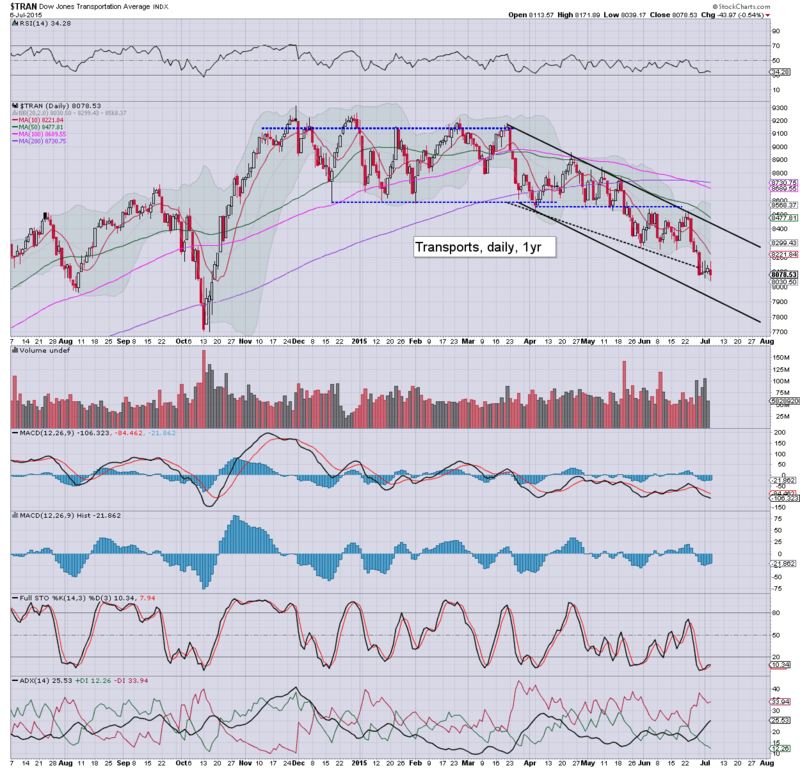 The Oct low of 7700 looks viable AFTER the next up cycle.. which itself might hit the 8500s or so. A day for the equity bears, although clearly, not the amount of downside that many would have been dreaming about this past Sunday night. Regardless of the intraday swings, further downside looks due across the next few days. Sustained price action under the giant sp' 2K threshold looks extremely unlikely in the current down cycle. 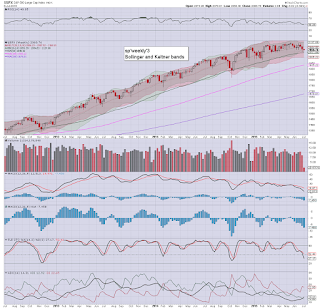 More likely... a floor in the 2040/30s.... and then resuming higher into August.